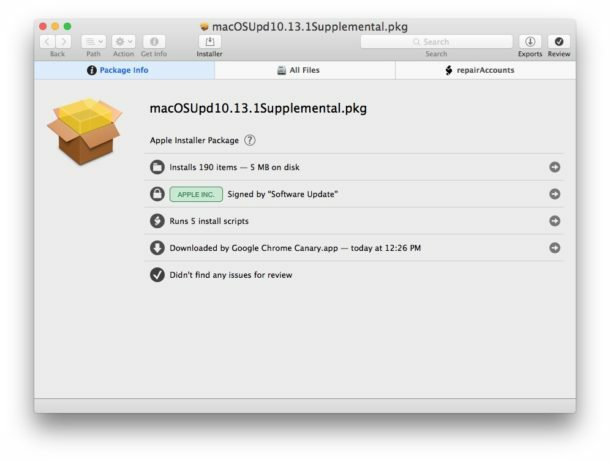 A second small supplemental software update has been released for MacOS High Sierra users who installed the prior release of Security Update 2017-001 for High Sierra, which fixed the root login bug but then caused a problem with file sharing. The new small software update, which apparently resolves the file sharing issue along with the root login bug, changes the build of macOS High Sierra to 17B1003. The new update should download and arrive automatically to impacted Macs running macOS High Sierra 10.13.1. If the update doesn’t install manually, then you get the update yourself as well by using the command line softwareupdate utility, or by visiting the Mac App Store “Updates” tab where you might see another version of “Security Update 2017-001” available to download. If the build reported is “17B1002” then you have not yet installed the new updated version of the Security Update, which should fix the file sharing bug. If the build reported is “17B1003” then the new fixed version has been installed already. Assuming the version you see is 17B1002, then you can manually initiate the software update through the command line, either by choosing it specifically, or by installing all available software updates for that Mac. You can then blanket install all available software updates with the -ia flag, or you can specify the specific Security Update update only. 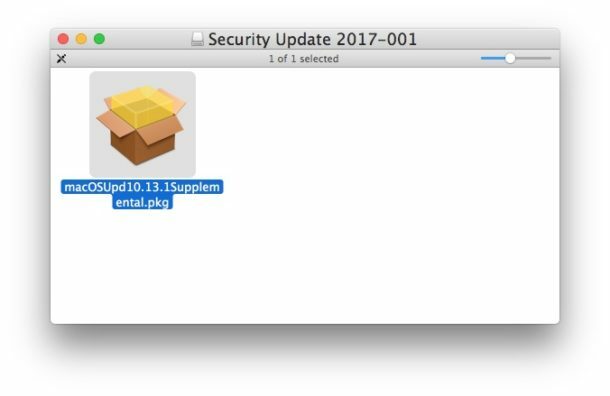 softwareupdate -i "Security Update 2017-001"
A special thanks to @gregneagle on Twitter for pointing this out and confirming that 17B1003 patches the file sharing issue with macOS High Sierra. As always, it’s a good idea to backup a Mac before installing any software update. What’s with the banner image of the Suspicious Package app? That’s going to be confusing to less savvy readers. They’re going to wonder WTF that is. Amen! Did that weeks ago. I was fixed file sharing with above script on one macbook running macOS High Sierra. But, how about El Capitan? This is only for macOS High Sierra. None of this applies to MacOS Sierra or El Capitan as they were not impacted originally. hai still i am not able to enable ftp to scan from my printer. I’m running 10.13.2 and the sharing to Twitter is still broken. Come on Apple, fix this bug!